Well it's been a few days since the race and I've had some time to digest the whole race experience. So many words come to mind when I think about how to describe this race, but here are just two -- hard, rewarding. I could probably just quit there but I'm long winded, so I won't. This recap is incredibly long but I dislike splitting one race into multiple parts so it's all here with plenty of details because I like that stuff. I have a history of preparing very poorly for races--going to a bachelorette party the night before, staying up till 3 a.m. while consuming plenty of Busch Light, and the general going to bars and staying out late--so why change my bad prep this time around? I had a lot to do on the day before the race. Woke up bright and early to wash and hang up a few loads of laundry, make peach crisp, ride my bike for 15 minutes while said crisp was baking, run for 15 minutes, visit the bank, and pack my bag for the rest of the weekend. All before 10:15 am so I could drive to Matt's apartment in Cedar Rapids. Much more productive than my normal Saturday mornings! 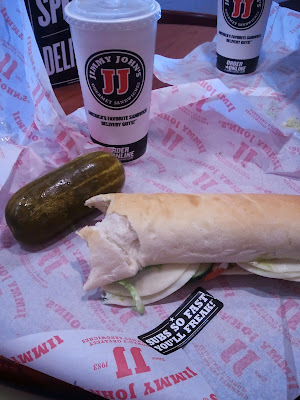 I convinced Matt to take me out for my favorite pre-race meal of Jimmy John's. Complete with a pickle! From there, we headed to packet pick-up for the race. I was able to get in and out of there in less than 10 minutes with my race numbers, shirt, and lots of freebie samples like chapstick, bio-freeze, and even Aquaphor. Next up was Coralville to visit Matt's mom who recently graduated from nursing school. Since we weren't able to attend her party later that evening, we wanted to stop by and celebrate eat some of the smoked pork early. It was delicious! Does this day seem full enough yet? Because it's not even over. Back on the road again and headed north to Cedar Falls. Matt managed to get us invited to the wedding of a couple he had only met once previously at the housewarming party of his coworker. They must have really hit it off because the couple insisted Matt attend their wedding. That means that I was going to a wedding where I had never met the bride or groom before. Strange feeling going through the receiving line and introducing yourself before you say congratulations. The ceremony was beautiful as was the reception and I wore heels, danced, had two glasses of wine and a beer, and ate strange food for dinner. We had a great time, but we ended up staying much to late and didn't start the hour drive back to Cedar Rapids until 10 o'clock. Ergh! Once we got back, I quickly laid out my stuff for the morning and headed to bed. In the morning, I ate some peanut butter and banana toast before loading up the bikes and heading out to Pleasant Creek State Park. We had no problems getting to the park and there was plenty of parking. Race number mark-up and getting my chip was easy and quick and I found my bike rack and set-up. I did have to wait at least 15 minutes in line for the porta potty which was frustrating because it was almost closing time for transition by the time I was out. After grabbing a chewy bar for another snack before the race, I met Matt for the walk down to the beach. The Olympic distance athletes were starting at 7:30 am and I was estimated to start at 8:02 am. So after the pre-race meeting at 7:15 am I started the process of putting my wetsuit on. That is seriously a warm up in itself. Athletes were still allowed in the lake in a swim area away from the swim course, so I took advantage of that to adjust to the water temp and swim a few hundred yards. My mom showed up a few minutes before I needed to line-up and I got the chance to talk with her. I am so thankful that Matt and my mom were able to come support at this race. I know it is a long day for them but it really means a lot to me to have someone there to cheer for me and be there at the finish line. So race time. This race was a time-trial start so one participant started about every 2-3 seconds. This makes a huge difference in crowding/kicking/getting hit in the face at the start which has the added bonus of a much lower heart rate for me. When the timer said "Go!" I ran into the water, dove in, and started swimming. The water clarity was a nice change of pace from the last few races I've done--I could actually see my hands and the water didn't taste bad! 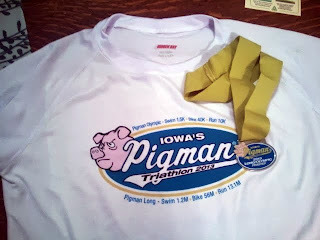 With a water temperature in the low 70's (possibly 73), the race was wetsuit-legal but the water was still nice and warm. Wetsuits add a lot of buoyancy and help me glide better so a wetsuit-legal race is a bonus. 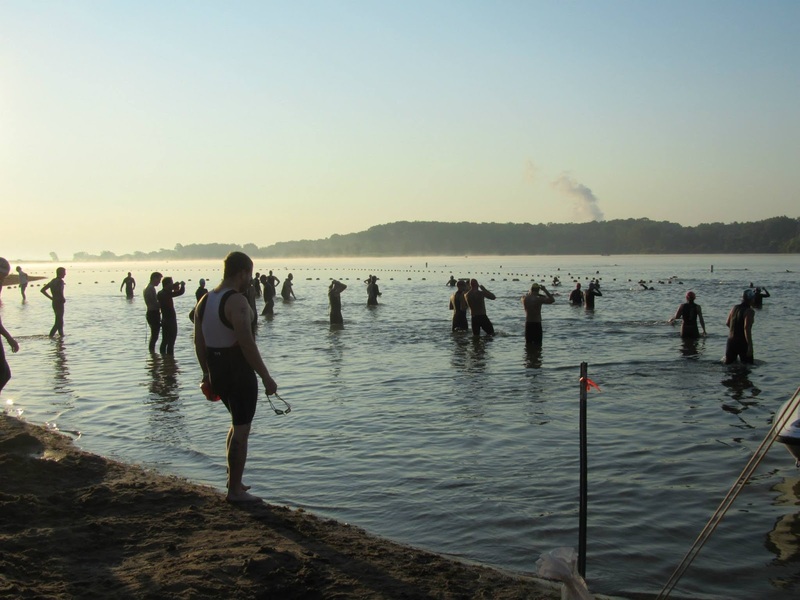 Passing people, keeping an easy pace, and focusing on steady breathing was the name of the game for this swim and overall, it was uneventful. A lower heart rate and expenditure early on in the race pays off later in the race. Before the race, I told Matt my swim time would be about 35 minutes and I was spot on. Out of the water, swim cap off, goggles off, and run up the beach into transition. Random side note, I hate walking barefoot on pavement because I have tender baby feet, but for some reason during triathlons, I run on that pavement like no one's business! They do usually sweep for rocks and other sharp object which is very helpful for said baby feet. My adrenaline was high and I felt great as I stripped off my wetsuit and pulled on my socks and shoes. I really wanted to cut down on my transition times this HIM and a smaller transition area definitely aided that but I also tried not to dwadle as much while pulling on my cycling gear. Once I grabbed my bike, I was outta there and on the road. The entrance to the park is at the top of a big hill off of a county road and to get to the start/finish/transition area you follow the park road for two miles back down the hill and over to the beach area. Remember this fact because it becomes very important later on. It's common for my heart rate to shoot up as I come out of the water and into transition probably from the position change from horizontal to vertical and the sudden running so the first part of the bike I concentrate on settling my heart and breathing again. A big hill makes this much harder to do! But I made it and my heart calmed down a bit on the downhill. The bike course is an out and back on county roads winding its way through some small Iowa towns. Several times we crossed over railroad tracks and I saw several dislodged water bottles on the road. Tracks are very bumpy and at one of these crossings about 5 miles in, I lost the signal from my bike computer. I rode the next 50 miles blind with my bike computer kicking in sporadically to tell me I was going 20 mph downhill or 9 mph uphill, but as this was rolling hill course, I was more concerned with average speed and the kick in the pants I needed when going only 15 mph on the flats. Instead I rode by feel, in that this-is-slightly-uncomfortable-but-maintainable pace. At one point, I saw a dog on the road. It's fairly common for dogs to roam free in the country and I've been chased by a few dogs on my previous bike rides, but I was scared for this dog. I could tell he was friendly and he just kept trotting from one cyclist to the next like "Hey, pet me!" but with cyclist zooming by at 15 mph and upwards it was a dangerous situation. Especially if he got to close to a bike or a cyclist swerved to go around him so I yelled at him to go home. He was gone on my way back in though so I hoped nothing happened! My only other experience at a half-Ironman was the Ironman-branded Racine last year. I knew this race was more bare bones than the slightly-over-the-top Racine race and was a little worried about aid stations. But I had absolutely no reason to worry with 5 total aid stations on the bike all with bottles of cold water and the middle three having HEED. Of course they weren't as fancy as the Racine stations with the tents and tons of volunteers, but the volunteers at Pigman did an excellent job handing off bottles! The railroad tracks proved to be my nemesis once again on the second half of the course. I had eaten only 2 of 6 of my second back off ShotBloks when the package flopped out of my case on the bumps. Goodbye to about 200 calories. So just a warning to future athletes make sure everything on your bike is secured or you may have to live without it. I still managed to take in 8 Shotbloks, one citrus Shot gel, a bottle of HEED, plus lots of water. I'm fairly certain those extra ShotBlok calories would have come in handy later. I felt good as I cruised up the big hill to the entrance of the park and then spun easily on the downhill into transition. Trotting into transition with my bike, I waved and smiled at my spectacular spectators--my mom and Matt, before racking my bike and changing my shoes and socks. My bike time was slightly faster than the 3:05 I anticipated and I made it in just over 3 hours. I grabbed a quick drink and made a stop of the porta potties. Three cheers for good hydration! After the first mile, I encountered the big climb up to the park entrance. My pace was pretty slow but I convinced myself that is was actually easier to run uphill so I ran--delirium was already getting to me. The run course was another out and back on county roads with very little shade. In fact, I don't remember any shade. With a bright shining sun from above and pavement radiating heat from below, it was hot out there at 1 pm. Aid stations were at each mile and were a very welcome site as I took a cup of water and orange slices at each one. According to the mile signs and my stopwatch, I was holding about a 10 minute/mile pace. My brain was a little foggy but I figured if I could complete the run portion in less than ~2:20, I could beat 6 hours. 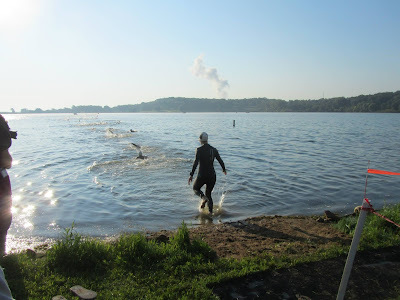 Running in a triathlon is a mental game for me--just run to the next aid station and you can have a break, but as the race goes on those thoughts start to break down. Run one mile becomes run half a mile becomes run three minutes. Till soon I am having a hard time convincing myself to run at all. At 6 miles, I thought I only had 6 miles left to go and was disappointed when I had to go another half mile to the turnout. Forgetting simple subtraction is not a good sign. Forcing myself to eat at each aid station was not pleasant, but I could feel that I needed food. Looking back, I think what I actually needed was salt. I tried eating some pretzels at mile 7 but being thirsty and eating super starchy pretzels was a terrible combination. The two in my mouth resulted in a ball of sandy mush. Taking salt tablets that they offered at the aid stations would probably have been a good idea, but as they say, "Hindsight is 20/20". Maybe I can try to use this information going forward. Somewhere between miles 8 and 10 the wheels really started coming off. Lower back cramps, pain on the bottoms of my feet, left glute hurting, and just general achiness and I-don't-wanna-run-ness. The faster you run the faster you can be done. I just can't run anymore. This big hill is killing me. All thoughts that went through my head in the final miles. At every aid station, I took water and put ice in my top and in my hat, but I still felt so hot. Running when I could and walking when I couldn't. The big hill up to the entrance of the park was just cruel but I knew after the uphill comes a big downhill. Even that final mile was challenging. Cars were coming and going from the park and I got stuck behind this pickup and the heat and exhaust were blowing in my face. I was so incredibly irritated, but just wanted the race to be over so I kept running. When it pulled away I was thrilled. As I came down towards the finish line, I could hear Matt and my mom cheering but I couldn't even smile. I didn't know what my time was but I didn't have to run anymore. It felt so good to be done. So good. I wanted to cry but it felt like I just didn't have any more energy to do so. There was this fantastic water tent at the finish with cold water dripping from the top and a pool with ice water. After that, I laid down in the shade for a while because I seriously thought I might puke. My skin was so salty and my mom thought it was so strange that you could feel the grittiness as you rubbed the salt off my legs. She needs to hang around me more after hot workouts I guess. 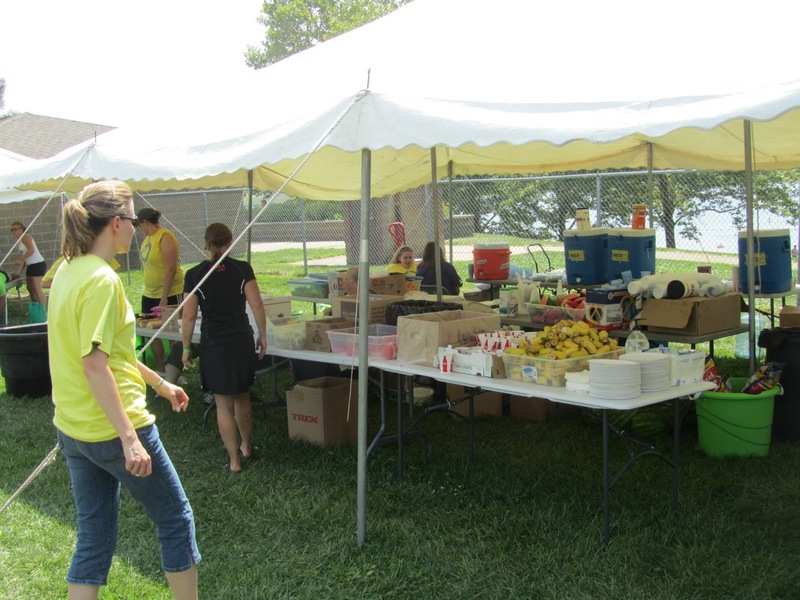 The post race food spread was quite impressive and included spaghetti and sauce, bread, pizza, tons of fruit options, cheese, candy, cookies, and bars. That's not even including the drink options! I shared some spaghetti with my mom and drank a whole bunch of Tang! That drink reminds me of so much of my childhood and now I have a container of it in my cupboards. A chiropractor and several massage therapists were there post-race and I hopped in line for a chiropractic adjustment. It's been a few years since I've visited a chiropractor and this adjustment felt so good. I think my back being slightly out of whack is contributing to my left glute problems so I may start up regular chiro appointments again soon. We didn't stick around too long after I got done eating because I needed to still drive back to Chicago that night. So after a quick rinse off at the beach showers (brrr! ), Matt helped me carry my gear back to the car. I took a full shower at his place and learned that my tri top really chafes my armpits. It freakin' hurt. Matt fed me Oreos to make up for it. I drove back to my parent's house to pick up my stuff and eat more before making the drive back to home. I wanted to leave plenty early so I wouldn't be too tired on the way home, but in reality I was tired anyways. The ice cream stop helped though. What kind of idiot wears high heels the day before a big, long goal race? And stays out late? I need to eat more and looking into salt tabs might be a good idea. Salt. Salt. Salt. I'm very proud of myself. Mostly for getting up and training all those times I wanted to lay on the couch instead. Sub-6 I'm coming for you and this race has proved it is within my reach. Thank you, thank you, thank you, to everyone who has supported me on this journey--all those who left encouraging comments, Kelly for the many bike rides, my family for understanding my strange commitments on the weekends, and especially Matt for the bike rides and all the encouragement and pep talks along the way (I'm the cat! ;-) ) I really could not have done it without you! If you take selfies with my camera, I will blog them.